A long day around the conference table with copious cups of green tea and hearty discussions about how we are going to try to convince Yunnan officials that their efforts at sustainability in Gaoligongshan National Park and historic Weishan city need work. We spent several days touring the sights, which was fun for me since I had never seen Gaoligongshan, an amazing national park with incredible biodiversity. We also saw the progress in Weishan, where I was VERY gratified to see the restoration on the Dong Yue temple, which our students worked on four years ago. 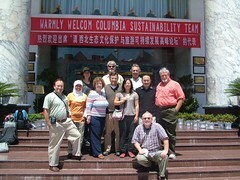 Here is the team after a week at it: Scott Wayne, Badi’ah, Christina Heyniger, Cheryl Hargrove, me, Jerry Adelmann, Jingjing Gao, Ted Eubanks, Ken Hao, Ted Shear and Floyd Thompson. We are dealing with challenges – the Chinese have great pressure to develop these sensitive natural areas and the wonderful historic town of Weishan, and little immediate incentive to follow the plans we have developed through the Center for US-China Arts Exchange since 2002. But that is the challenge of sustainability – being able to take the long view and recognize that the quick dollar is the one that kills the resource. Sustainable development is slow and long, and it lasts. But it is always a challenge to convince politicians – in any nation – of that fact. He gave it his all both day and night. How come American Airlines wants $5 for a box of nasty formaldafoods during a 4-hour flight to Mexico when Air India and Indian airlines will feed me hot food during an 1 ½ hour flight (or three hot meals during a 7-hour flight) and give out Johnny Walker Red like it was orange juice? Remind me which is the wealthier country, because from a consumer point of view, it ain’t us. I guess we are wealthier because you add up each individual’s wealth and divide by the population. That must be it, because by any cultural collective standards, we’re in the poorhouse. I am not into typical complaining about culture in terms of Paris Hilton and Lindsay Lohan and Tom Cruise and Starbucks and McDonalds and Wal-Mart. They have all of those things in Beijing and Sao Paolo and Kyiv and Paris and Lagos – that isn’t what makes us different. It doesn’t even make us bad. But we have become mean and cheap in a way most of the world doesn’t dare. I don’t think it is even economics, unless it is the economics of lawyering, which makes the USA one giant whipped-cream-covered superdelicious tort just waiting to be violated by gang lawsuits. In India they train 40 engineers for every lawyer, and in the US this ratio is reversed and one economy is growing and the other is stagnating and it doesn’t take a business degree to figure this out. Since I started working in China five years ago it has become clear to me that the economic strength of the US has lost its inevitability. There are more and better capitalists in India and China and it a matter of less and less time before they leave us in the dust. I have seen a seismic shift in five years and the response to the actual seismic event in Wenchuan proves the new China. This is not 2049 inevitability but 2019 inevitability. China is the man in their command of capitalism and their newfound economic confidence layered on top of a very, very old cultural confidence. It is almost the anti-preservation culture because while we in the West are concerned about authenticity and original fabric, China is not. They would just as soon rebuild something. Perhaps this is because they have a culture so deep and assured that it needs no physical reminders. The tour guides lament the demolition of Beijing’s city walls in the 1950s but maybe they tell us that for the same reason they take us to Joseph Rock’s house near Lijiang and the Joseph Stilwell museum in Chongqing, because these are American things and they assume that is what we want to hear and see. I was in China for two weeks and took six airline flights and every one of them was on time and the baggage came out as quick as the passengers and they fed you something on every flight even if it was only 45 minutes long. I waited more than 45 minutes for my luggage when I got back to Chicago. My fellow travelers commented on the dedication to service they encountered in China and contrasted it with home, where more and more service industries are acting like waiters in a Parisian café. Man, these young countries are hungry and willing to work hard and even though Americans work harder than their European counterparts we have always relied on a steady stream of hungry immigrants to do the heavy lifting. So where will those immigrants choose to go in 2019? Dateline: Chicago. The City Council approved the construction of a subterranean building in Grant Park Wednesday, complete with a liquor license. The Mayor and two-thirds of the aldermen supported it “on behalf of the children,” a reference to the building’s presumptive initial user: the Chicago Children’s Museum. The move may be challenged in court, and they might even lose, but the clout was lined up heavy. The Children’s Museum is leaving the State of Illinois’ number 1 tourist attraction, Navy Pier, for the location. A very curious decision for an organization that is facing a dropoff in its target age group and still needs to raise at least half of the $100 million construction cost. Actually, it is only a curious decision if you follow the spurious “for the children” argument. If you spend $100 million building a potential convention/meeting/banquet facility in Grant Park, you can recoup your costs quite simply by a sale. When the museum fails, they sell the facility to McCormick Place, for example, and recoup their investment. Now the scenario makes sense. Speaking of failed museums, the National Trust’s latest issue of Forum Journal is devoted to the challenge of the historic house museum, an institution in decline for most of this century. Two articles deserve special mention: the first by Trust staffer Max van Balgooy and the second by John and Anita Durel. Van Balgooy pierces a few presuppositions about the decline of the house museum. First, he decried our reliance on quantitative measures like number of visitors each site receives, noting that while two-thirds of National Trust sites saw drops in attendance over the last five years, the other third saw an increase, not attributable to differences in funding, locations, staffing or other conditions. Not only that, but house museums that run at a deficit are more likely to be organizations with assets over $500,000. Van Balgooy suggested moving away from quantity and toward qualitative measures, a position supported by the Durels, who brilliantly challenge the basic tourism model. For a century, house museums were conceived as tourist sites, and the operators of those museums focused on typical issues of curation and interpretation. We have long recognized the first fallacy of interpretation that is static and have begun innovative programming for diverse audiences. But now we have to come to terms with a new reality – tourism is for the birds. A tourist visits, maybe buys a book or a scarf or a refrigerator magnet, and then goes away. For most sites, that is it. The Durels basically say: bad business model. Forget the tourists. You want MEMBERS – people invested in the place. A generation of Baby Boomers is going into a very active retirement, pursuing hobbies, avocations and passions, and if historic sites can make themselves the location for those activities, they will thrive. You see, a member has a vested interest in a place. It has ALWAYS been difficult to run a house museum based on a few thousand visitors a year. Take a look at the economics: Let’s say it costs $150,000 a year to run your house museum. You get 15,000 visitors at $10 each and you can just make it. You get 12,000 one year and you are in deficit. You get 8,000 and you are in crisis. 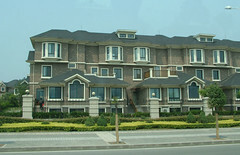 My personal home costs $50,000 a year to own and operate. Yet it has only two paying customers. That’s the key right there: it ain’t the NUMBER of visitors, it is the QUALITY of their engagement. Better to have 20 good people showing up every month than a 100 who come once and only once. Historic sites need to be community centers; they need to be constantly changing and they need to be always engaging the next generation – who may well decide that historic buildings are much more valuable than children’s museums. 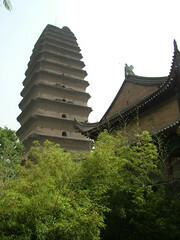 This is of course the Small Wild Goose Pagoda in Xi’an, which was much bigger than I thought it would be. They have a new museum which is really quite excellent, featuring that staple of Chinese urban museums, the absolutely massive model – in this case of Tang era Xi’an,a city of a million with streets 600 feet wide. We are more than halfway through the trip, and traveling with the Art Institute as a Study Leader allows me to not worry about all of the details we have when we bring students here. As a consequence, I enjoyed Beijing a lot more (we even ran into one of the Gao Brothers in the 798 Arts District and he took us on a tour of his private studio – he is making giant colorful statues of a infantilized Mao with breasts) and even Lijiang’s relentless tourism seemed less disturbing. Or maybe it is just familiarity, which is not breeding contempt. but you spend time in a country regularly over a few years and the strangeness leaves. Those clamoring limbless beggars and insistent merchants and bright lights and local vehicles and smells and foods all become an everyday you have lived before and much of it recedes into the rear of the picture plane. There is something lost in the decline of the exotic experience, and what is lost is clearly an innocence, but then again I wouldn’t be a study leader here if I was still an innocent. What was odd was my reaction to the terra cotta soldiers in Xi’an which may have reflected my mood. It was great, but not overwhelming somehow after years and years of anticipation, and like the new Xi’an museum it was actually first class by any world standards. I guess that is the most amazing thing about the new China – it isn’t third world anymore – there is plenty of feudalism and human misery in the rear of the picture plane but the place as a whole is confidently surging into its inevitable leadership role, Pundits like to complain about the growing gap between rich and poor and the strides yet to be made in human and civil rights but this is a place that has witnessed a thousand percent increase in both rights and prosperity in the last 15 years. We have no idea at all what that feels like. I have lectured on architecture and the arts (with a focus on Buddhism Taoism and Confucianism) so far and my last one is on landscape painting. The Chinese landscape painting, like the landscape and the timescape we have been in here is a thing that is not compartmentalized like the impossibly hermetic Western view of Nature as the other. It is not Nature without the human and while the Nature is sublime, it is only sublime due to the human pavilions and wanderers who inhabit, observe and experience it. It is a landscape seen from multiple dimensions at once, not in a fractured or fracturing way like the Cubists, but in a natural and harmonious way. The goal of the artist is harmony just as the goal of society is harmony with nature, not its conquest or its deification. All perspectives find room in the picture plane not as representation or realism in a graphic sense but realism in a human and natural sense. That is what I am feeling this trip – Xie He’s qi yun shen dong – spirit resonance,a harmony of nature and a recognition that art is the human appropriation of nature that allows nature to become. You are currently browsing the Time Tells blog archives for June, 2008.